Join us at one of our new locations in Port Alice the wild west coast getaway Quatsino Sound for our 2019 World Class Fully Guided Sports Fishing Season. US Guests Get approx. 25-55% OFF, Book Now! 1-855-805-3474 All Charters are in Canadian Funds. We are offering an All-Inclusive Wild West Coast BC Spot Prawn & Bottom fishing package out of Quatsino Sound for Late March, April, May & early June. Regular Peek Season fish and stay packages are also available. This is one of our best-kept secrets and we offer it exclusively for Quatsino Sound Only!. It’s a short Prawn season that starts in April and Stops end of May or early June. You will be met at the airport, if required and transferred to your accommodations. Your charter package will include a professional charter guide, private use of our custom 27-foot offshore Sea Ray, bait, tackle and equipment. You won’t find a Fresher Product Then Self Caught Halibut, Prawns or Salmon. So come visit us in Port Alice the wild west coast getaway Quatsino Sound Vancouver Island for some all-inclusive world class guided fishing. Your fish will never be previously frozen siting in some freezer somewhere and it will be caught by you and your fishing party with the help of our amazing guide and Captain Steven Cahill. So come see us this year and get yours. We also offer our great service with picks ups and launches out of Port McNeill, Port Hardy & Quatsino Sound as well. #WeGoWhereTheFishAre. We Do Our Very Best To Meet Everyone’s Expectations. Thank you all. Tight Lines and See You All Soon. All Charters Packages will Include Professional charter guide, private use of our Custom 27ft offshore Sea Ray, Bait, Tackle, and Equipment. We provide transportation to and from the Port Hardy/Port McNeill airport or ferry terminal as well as comfortable private accommodations, 3 meals per day, and the processing, vacuum sealing, freezing and boxing of your fish for transport. Book now and receive 20% off all charter packages & 15% on all day trips from From May 1 – June 14th and August 27th – October 30th US Guest Get Approx. 25-35% off with current exchange rate. 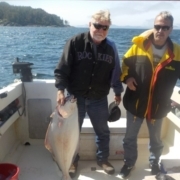 If You want your north west coast fishing charter to yield fish. Master Guide Steven Cahill has been putting guests on the fish on the North coast for many years now and he’s gained a reputation as one of the best charter and lodges on the North Coast. 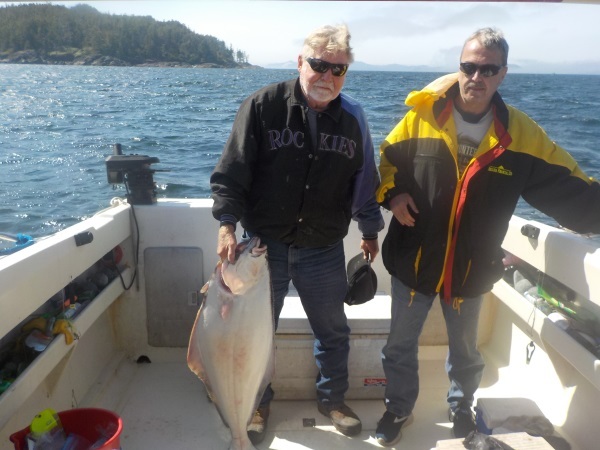 Hook’n Them Up takes guided anglers like you to the best salmon fishing , halibut fishing and sports fishing on Canada’s pacific north coast. 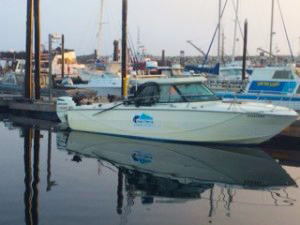 Hook’n Them Up Fishing Charters offers one the safest boats and longest hours on the water of anyone on Northern Vancouver Island. #WeGoWhereTheFishAre. and because of it, we catch more fish than most guided adventures in our area. We have the following dates available for this very short prawn season . Dates are as follows for peak season. April 6-10, April 11-15, April 16-20, April 21-25, April 26-28, May 1-5, May 6-10, May 11-15, May 16-20, May 21-25, May 26-30. Of course their is some fantastic Winter King/Chinook, fishing during this time. We can alter some dates to accommodate your needs please let us know asap so we can offer our rates and dates to others seeking our great service that we provide. The 5night & 4 Day Package that will include over 40hrs of guiding by Master Guide Steven Cahill. If you fly into Port Hardy we will transport you to our executive style lodge. We Also include your vacuum sealing and processing of your fish to DFO standards and practices. I’m sorry we cannot custom process outside these guide lines. This would make a great deal for the fisherman in your family. We can also accommodate for a 4 night & 3 Day Package call for details.